This review was sponsored by BariatricPal.com. All opinions are my own. Ok before we get into the glorious world of chips, I need to tell you that BariatricPal is offering us a suh-WEET discount on these protein chips, guys. 25% off BariatricPal brand chips (hint: look for the ones with the names I reference in this review) with code FOODIECHIPS! But hurry…the coupon expires June 30, 2017. Go, get yo’ crunch on! So Foodies. You may not know this about me, but there are a great many things that tempt you guys that does not tempt me. Sweets? Eh. I think my surgeon fiddled with my sweet tooth while he was operating. Pasta? It only took a few times of it making me sick (and also figuring out that, on its own, it has ZERO flavor AND learning how to make zoodles) for me to do like Elsa and “let it go…” Fried foods? Yeah. You don’t wanna see what happens when I eat fried foods. But chips? 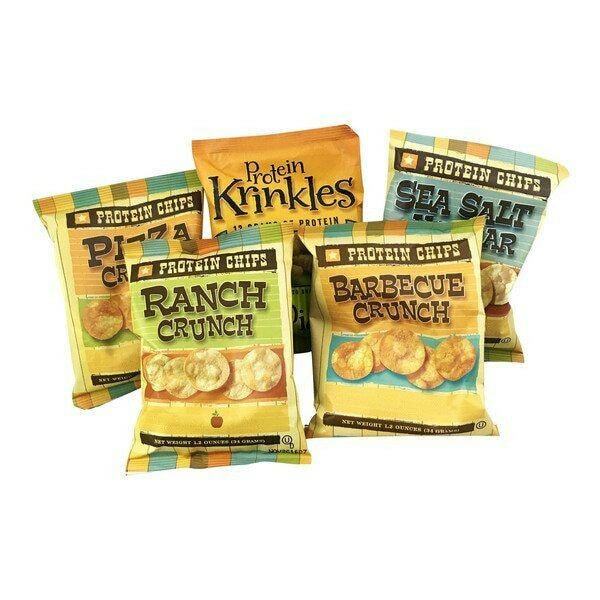 Like…crunchy, flavorful, salty chips? So when I decided to team up with BariatricPal, naturally the first thing I wanted to get my grubby little hands on were some of their protein chips! Now understand I have protein chip trust issues. I won’t name names but there are certain companies that make protein chips that I did NOT care for at all. (Bribe me with peanut butter and I may tell you who it is.) But there are a few brands that I also really like. (Same bribe applies.) So I was curious to try BariaricPal protein chips, since I have tried a number of them before. You ready to do this? Awesome! So far as the packaging, there’s not much that’s unique about it. It has a bit of a cowboy vibe, which is cute. the flavors are easily identifiable. Yadda. The chip looks pretty standard as far as protein chips go. It reminds me of Special K Cracker Chips, which I’m currently not allowed to think about (or eat). Because I tend to eat all the chips. And when I say all the chips I mean ALLLLLLLL the chips. But I digress. Depending on the flavor (we’ll get to that in a minute), they do have a generous coating on the outside and I was a bit nervous about that. Ok so here’s where we have to take a step back and look at the bigger picture. Chips are never going to be health food. When companies (like the one who shall not be named) bend the will of the universe to produce chips with macros that put them into the health food column, it’s just not good. Chips are chips, folks. I should note that these do not adhere to the 10:1 protein ration (1 gram of protein for every 10 calories), but then I’ve found only one brand of protein chip that does and, again, I didn’t like it. We each have our own nutritional non-negotiables, though, so use yours! I usually separate flavor and mouth-feel in reviews, but here you can’t talk about one without talking about the other. That potential land mine past us, let’s talk flavor. I’m going to give you my and Shannon’s snap judgement on the chips, by flavor. Ranch Crunch: True to its flavor, crunchy. Had to stick our heads ALL the way in the bag to get a whiff of ranch. Pizza Crunch: Eh. It tasted like pizza spices, but not so much like pizza as a whole. We didn’t hate it but it wasn’t our favorite. Did have a saucy smell. BBQ Crunch: Another “head in bag to smell” situation and we both though the flavor could stand to kick up a notch. Sea Salt & Vinegar: On this one, Shannon and I differed. She thought it tasted more like a sour cream & onion chip. I definitely tasted the vinegar but I like my salt & vinegar chips so sour they make your lips pucker (among other physical reactions), so they weren’t quite sour enough to stand against a regular salt & vinegar chip BUT both Shannon and I really enjoyed the chip regardless, on its own merit! Dill Krinkles: Now these are a bit different in shape. They kinda look like Ore-Ida crinkle-cut French fries. Again, Shannon and I differed in opinion. She thought they tasted the way the salt & vinegar should. I thought it had a good dill pickle flavor (which may actually mean I agree with her but I’m not sure). OVERALL, we both thought the texture of the chips was really nice. They were crunchy. Not as flaky as a regular potato chip, but not hard or chewy, which was good! Is that good or bad? You decide. The price per protein gram is best used when comparing products that come in different sizes and quantities. Here’s how you calculate it. I will say that’s not the best or worst price I’ve seen. Your mileage may vary. Shannon liked the Dill Krinkles best, although I haven’t asked her if she’ll purchase any for herself. I will say, though, that the discount BariatricPal has given us is a GREAT opportunity to give these a try and see what YOU think. Take me to the chips!